Hunt Companies provides service members and their families with quality living that they deserve. Hunt Companies wanted their professionalism to translate through their online presence. Having over 30 properties with their own sets of assets could prove challenging. Luckily, it’s Stanton Street’s forte. We have the level of professionalism, organization and creativity that Hunt Companies looks for when redesigning a website. Identifying the needs of the client is always the first step we take when developing a new website or revamping one. 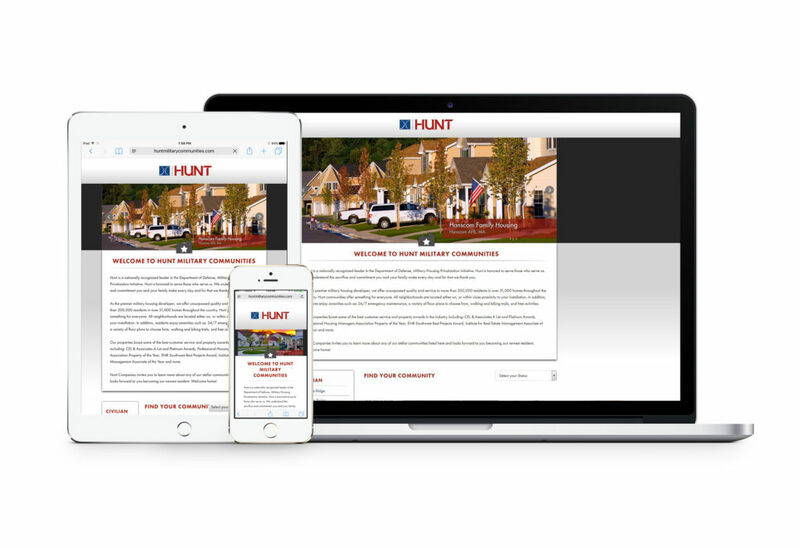 In the instance of Hunt Military Communities, we knew that users needed to be able to access documents, forms and other services from any mobile device or tablet. The sites also needed to contain content geared toward current and future residents. To easily organize the properties, we created a “gateway” page that gives new and prospective residents the ability to filter and search for applicable locations. Upon opening the gateway page, users are greeted with colorful thumbnails that represent each community. The page is neatly organized by branch: Navy, Air Force, Army, Marines and Civilian. Properties can also be filtered by the user’s status. When a desired location is selected, users are directed to the homepage that displays imagery of their community along with functions such as: wait list lookup, rental applications, maintenance requests, rental payments, and “Find Your Home.” A site search is also readily available to get the user to a topic quickly. The website is also host to resident newsletters, documents and forms, helpful links and frequently asked questions. The interactive community map provides residents with a quick overview of parks, basketball courts, and other recreational activities. Contact Us pages have been formatted to include phone numbers, addresses and management team information. New, current and prospective residents can easily reach out to management through general inquiries and leasing forms. We appreciate the opportunity to partner with Hunt Military Communities and create optimal experiences for their service member’s past, present and future. If you are interested in redesigning your site or would like to develop new one, fill out our contact form. We would be happy to help you!